At 9:15am On 3/23/18 I attended the Certiport certification lab presented by Certiport at the 2018 NCCIA Conference located at Asheville-Buncomb Technical Community College in Asheville, NC. 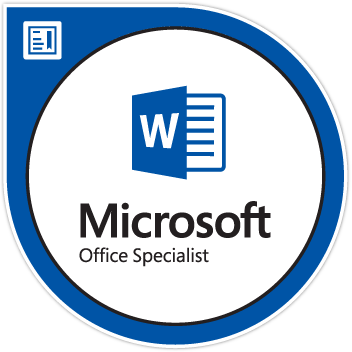 Microsoft Office Specialist status in Word 2016 Achieved! I chose to attempt this exam because of my success with the interactive PowerPoint certification program I had taken earlier. During the course of this examination I had to clearly establish my ability to perform a number of Word tasks, such as creating and managing documents, formatting text, paragraphs and sections, creating tables and lists, applying references and inserting and formatting objects. The straightforward Word evaluation challenges individuals to complete a comprehensive project that depicts real-world functionality with project and standards-based outcome testing. Probably the most difficult thing about this product certification was the unrelenting amount of projects required to achieve success, each with multiple courses to completion and numerous tasks which needed to be completed to receive the material. Worst still, was that this timed examination required all the materials to be completed in a timely manner, as one might find in the workplace. Not knowing a particular function might easily eat up time during the examination and stop you from being able to complete numerous projects in the time required. I was pleased with my progression. Microsoft Office Specialist certification is the only official Microsoft-recognized certification for Microsoft Office globally. All in all, this test was a great deal harder than I suspected, but then again it was a Specialist Designation. To succeed I truly needed to have an in-depth understanding of the Microsoft Word environment and the ability to complete tasks independently based on written instructions only. This included demonstration of the correct application of principle features in Word 2016 by creating and editing 2-to-3-page documents for a variety of purposes and situations. Document examples included professional-looking reports, multi-column newsletters, résumés, and business correspondence. MOS 2016 certification exams seem to introduce a performance-based format for improved testing of a candidate’s knowledge, skills and abilities using the MOS 2016 programs. MOS PowerPoint 2016 exam task instructions generally did not include the command name as in previous versions. For example, function names were avoided, and were replaced with descriptors instead. This meant I had to understand the purpose and common usage of program functionality in order to successfully complete the tasks in each of the projects, and there were many projects to be completed in the time allowed. The materials had an excellent amount of in-depth knowledge requirement,s and while I suffered a bit with the knowledge of managing multiple papers at once, I was able to break through with a score in the mid 800s. It was a good challenge, and I felt my skills were pushed, especially since this was a time-sensitive examination. This entry was posted in Certification, Professional Development and tagged collaboration, communication, Core document creation, customize, dockery, document, format, graphics, group, issues, manage, Microsoft Office, Microsoft Office Specialist, Microsoft Word, modify, MOS, order, paragraphs, tables, text, tyler, Tyler Dockery, views, Word, Word 2016.